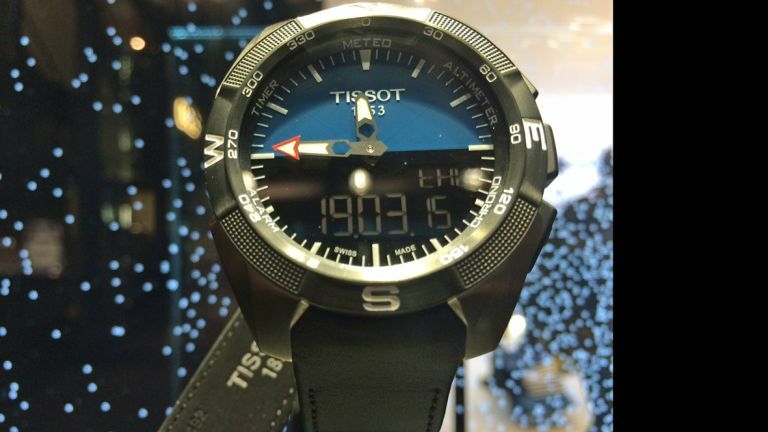 Baselworld 2015 has kicked off, and pioneering brand Tissot is prepping a smartwatch for this year. Tissot has pre-announced a connected version of the T Touch Pro Solar touch panel watch. Although nothing is confirmed yet, all very hush-hush, we shouldn't even be telling you this, it's currently intended to have built-in GPS, and iOS and Android connectivity via a range of apps. One thing it won't have is a screen. Instead, notifications will come via vibrations, lights and/or sound. They're not quite sure yet, but it'll be whichever proves to drain the battery the least. Apparently Tissot has been discussing a smartwatch internally for three years, and was waiting for the market to be ready. Now that Apple is entering the fray, it seems the time is right. It's only a prototype at the moment, hence there's no photo of it - what you see here is the existing T Touch Pro Solar. All we know beyond that is that a third party is making the software. The battery tops up via solar energy, rather than being completely solar powered. Tissot is just the latest traditional watchmaker to announce a smart model. Swatch, Breitling, Mondaine, Alpina, Frederique Contsant and now Tag Heuer have all jumped on the smartwatch bandwagon of late. Why is this? Either the Apple Watch has widened the market, and they're taking advantage of the new-found awareness of smartwatches. Or they're panicked that Apple will decimate their industry in the same way it did with smartphones and tablets, and so are rushing out products in the vague hope of quelling the threat.